It's the most wonderful time of the year! With the holidays upon us, the Fifth Worlders reflect on their favorite holiday tales featuring comic book characters. Every Friday, we will host a virtual panel session on a topic of the week, capturing The Fifth World staff having a dialogue about a given subject. 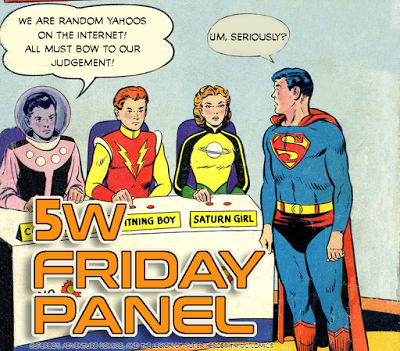 This week's topic: favorite holiday comics! 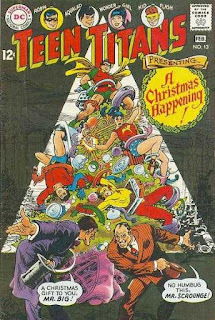 JL Franke: "The TT's Swingin' Christmas Carol"
You could make an entire omnibus-sized edition just out of comic book adaptions, homages, and spoofs of A Christmas Carol. This version is my favorite. In the spirit of almost all Bob Haney tales, it's a breezy story, opening with a virtual advertisement for DC Comics, as the Titans try to convince Robin to put down his copy of Dickens and read some Aquaman or Wonder Woman instead. Haney then shifts focus quickly on the travails of poor Bob Ratchet, who works for Mr. Scrounge doing bookkeeping at the Junkorama. Scrounge is the ultimate skinflint, not even willing to pay to heat the office on a snowy night, but Ratchet needs the overtime to pay for a new wheelchair for his son, Tiny Tom (who's a full on teenager and not so tiny). Tom alerts the Titans to Scrounge's deal with the criminal Mr. Big, whose smuggling operation uses a ray gun to reveal the junk they're passing through his junkyard as high end products they're passing through ports without paying duty. Despite all this, the Titans take until page 11 to realize they're reliving A Christmas Carol. 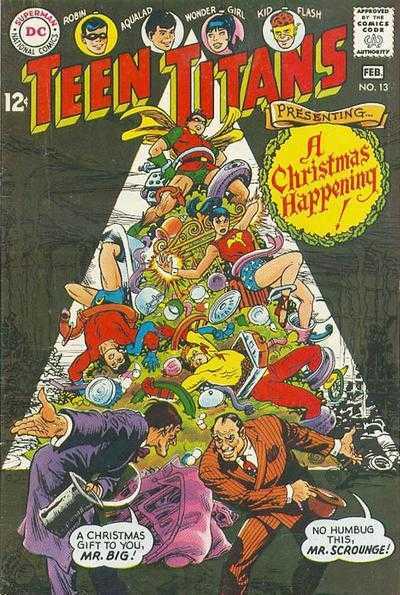 Hi jinks ensue at that point as Scrounge is visited first by his old partner Jacob Farley, freshly escaped from prison, then the Titans disguised as the ghosts of Christmases Past, Present, and Future (Nick Cardy draws Wonder Girl as a particularly babelicious Ghost of Christmas Future, flying around in a high cut Santa suit). The criminals show up just as Scrounge turns his attitude around, and the ensuing fight features magnets, trash compactors, and heroes trapped in piles of junk. This being a Christmas story, everything turns out just fine, with Scrounge making things good for Bob and Tiny Tom, with Tiny Tom getting the final word, as usual. Sean Fields: "It's the Most Loneliest Time of the Year!" I wanted to include someting fairly recent here. Annuals are usually fun reads and this one is no different. 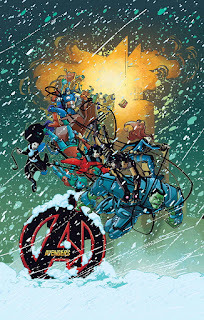 It's a Christmas tale starting with Shang-Chi bringing teens to Avengers Tower to meet and get advice from some of his fellow teammates before they go away for the holidays. The teens meet Tony (Iron Man), Bruce (The Hulk), Steve (Captain America) and Natasha (Black Widow) giving advice very specific to their natures before the kids are teleported away by Eden Fesi. The Avengers all depart to their holidays, again what you would expect from each of these folks, while Cap remains in the tower and in NYC. But he isn't alone. A lonely teenager named Zamira hides out when the rest of her group leaves and Zamira has...abilities. I don't want to give too much away but the story is nutty. Christmas cheerleader robots show up and the Hulk fights a Christmas balloon if that gives you an indication of the tone of this story at points. There are also very human moments where the characters have to interact and confront themselves and be emotionally supportive of others. It has a weird bottle episode, Die Hard feel at moments and that is good. Plus, the characters are the very essence of who they are. 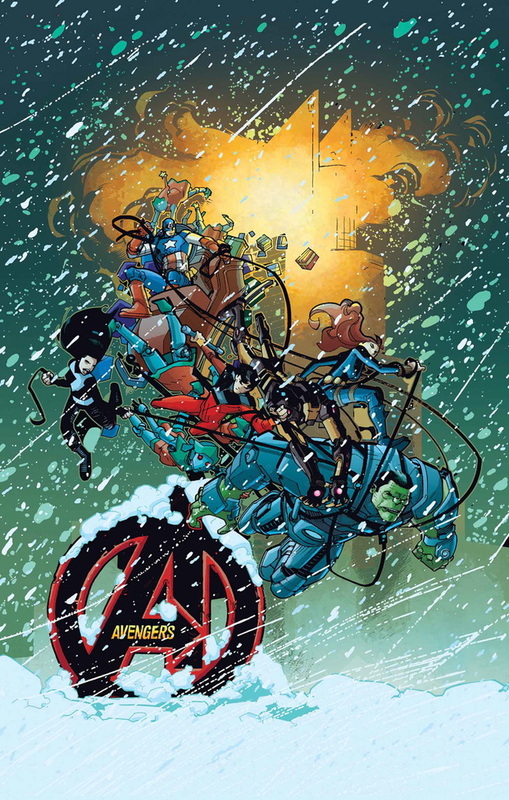 Kathryn Immonen and David Lafuente have crafted a fun and heartwarming Christmas story for the Avengers here. 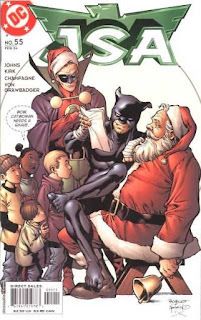 JL Franke: "Be Good for Goodness Sake"
The second straight issue of JSA to deal with the holidays (JSA 54 featured a memorable Thanksgiving dinner shared by the Justice Society and the Justice League, hearkening back to the old days). This Geoff Johns/Leonard Kirk reintroduces Ma Hunkel, the original Red Tornado, back to the team. Ma had gone into hiding to spare her family from possible retribution by members of a gang she testified against and helped get off the streets. Isolated from everyone she loves, the only respite Ma gets is every year on Christmas Eve, when she plays Santa for the local kids and is visited in that disguise by her old JSA friends. However, this Christmas, the heroes have good news for her, resulting in her becoming their housemother at their headquarters and regaining her old life. It's a happy ending for a little known but much loved Golden Age character, but what I love most about the story is the use of the holidays to explore the personalities and place for four of DC's oldest heroes, the Golden Age Flash, Green Lantern, Hawkman, and Wildcat. Johns normally does very solid character work in his books, but his Justice Society work was something special. In this particular issue, we get additional insight into each original JSAer. Jay Garrick (Flash) and his wife have never had kids, but are relishing being virtual parents to a young Bart Allen. Alan Scott (Green Lantern) regrets all the years he spent missing out on major holidays and personal events due to his focus on his broadcasting company, but now appreciates the chance to spend holidays with family. Ted Grant (Wildcat) likes to talk about being a party animal and being detached from anything serious, but he secretly hosts a community Christmas dinner for the homeless out of his gym. Carter Hall (Hawkman), who had just recently returned from the dead, feels the weight of loneliness at the holidays, allowing his usual stoicism to drop, just slightly. The interplay of these legends (and with Ma) puts a very human face to each and everyone and reminds the reader of the importance of family to holidays such as this. Set in Austria 1975, Krampusnacht is a very typical Hellboy tale. This means that is to the point, humorous, mythic and very good. It begins in media res with Hellboy investigating an old man who cause a telekinetic episode at a local church. As he is on the way to the man's house he encounters a ghost of a woman who asks him to "Please... save my boy." She disappears and Hellboy hears the man calling his name from his home to invite him in. 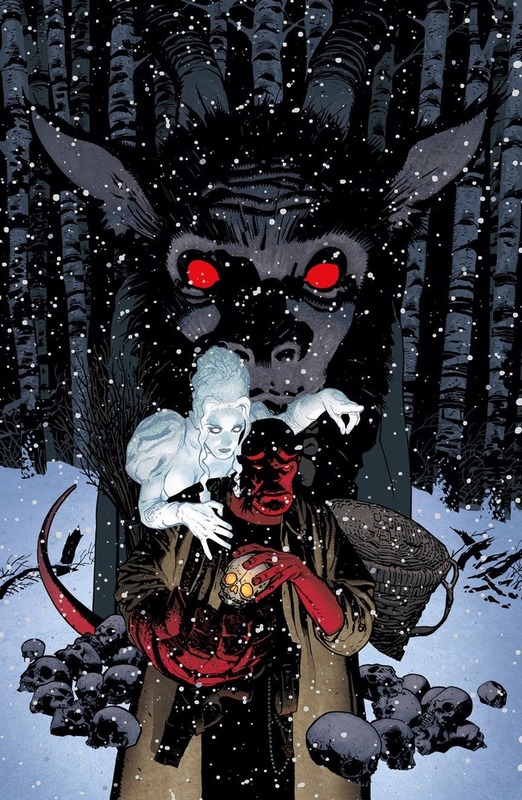 The old man identifies himself as the mythical figure Krampus and we are off and running into very familiar weird Hellboy territory. I'm in for any story involving Krampus. The idea of a vengeful Christmas spirit provides an odd balance for the countenance of jolly old Saint Nick. Krampus is a powerful and scary figure that evokes a primal, childlike fear and it is realized in this story with the remains of his victims of centuries of Krampus' work hidden in the house. This being a Hellboy story nothing is as simple as it presents itself to be. We realize that as we get to the end of this tale and to a more Christmas feel with HB back home with Liz and the Professor at B.P.R.D. headquarters. Mignola tells a good story and the art and color by Adam Hughes is amazing. It's a fun and quick Christmas story that should be read, preferably with low lights near a fireplace.